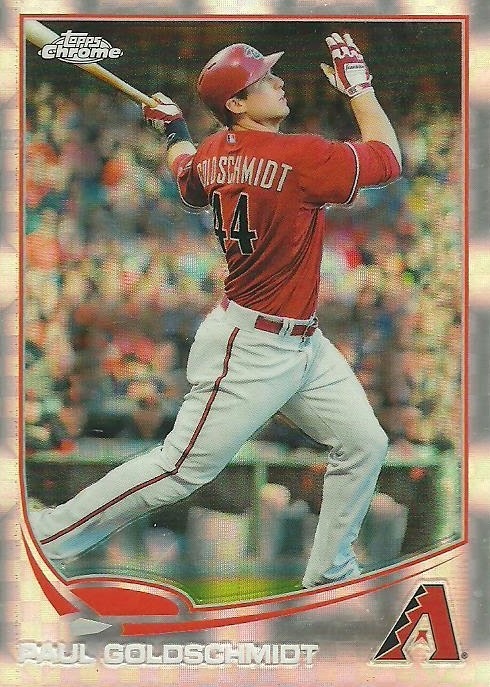 Against my better judgement I picked up a blaster box of 2014 Bowman. Here are the highlights of the box. 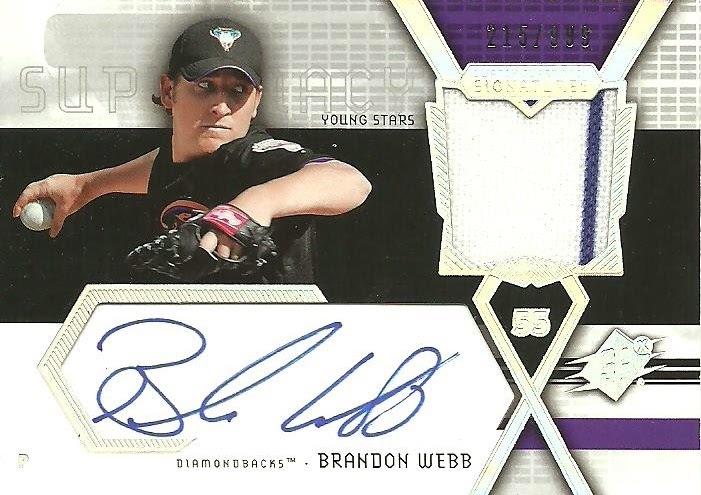 I picked up this 2004 SPx Brandon Webb Jersey Auto on eBay recently for $0.89 plus $2.50 shipping. 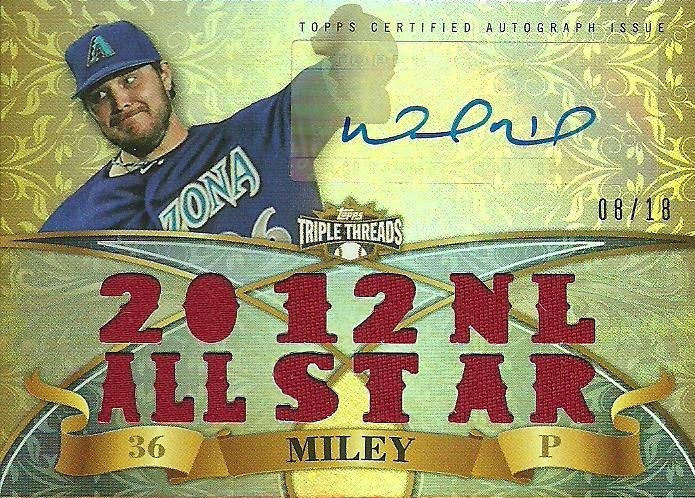 I picked this 2013 Triple Threads Wade Miley card up off eBay recently for $8.50 shipped. It's numbered 08/18. 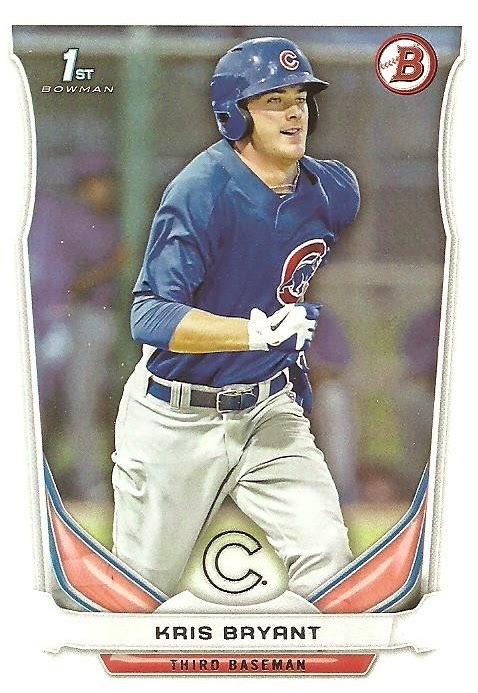 I really like the card, but it could be even better if the picture matched the jersey swatch and if the autograph was on card. 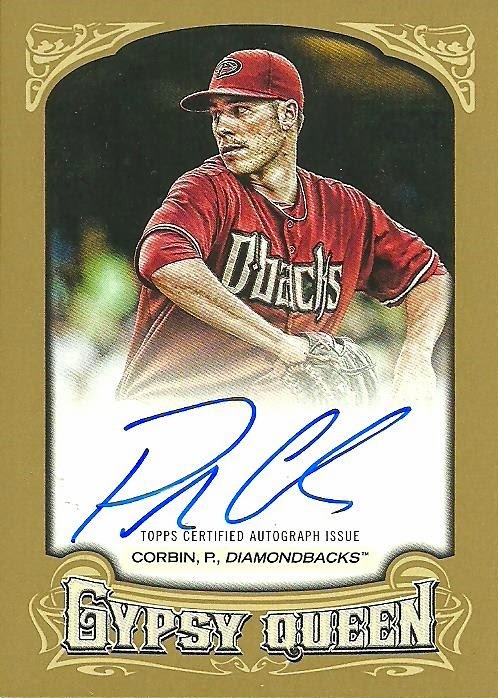 I picked up this 2014 Gypsy Queen Gold Patrick Corbin Auto numbered to 25 of eBay recently for just over $10 shipped. Here is a Patrick Corbin bobblehead that I got last month. It was my 40th different D-Backs bobblehead. I have since added number 41. 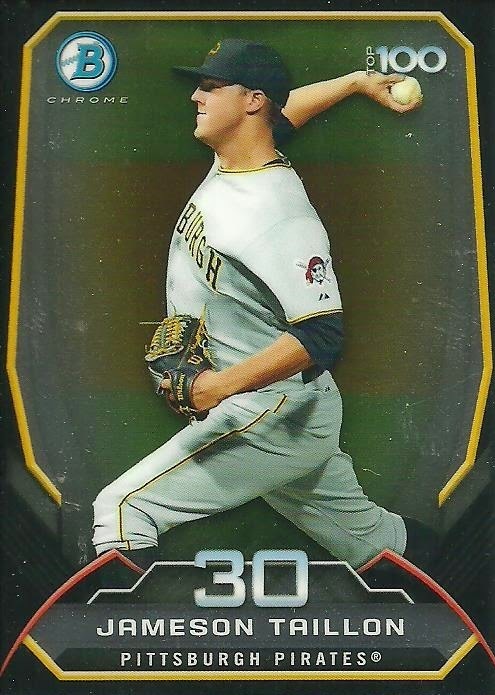 Corbin was an All-Star last season, but before this season started he underwent Tommy John surgery. Hopefully he recovers fully and is back to form next year. 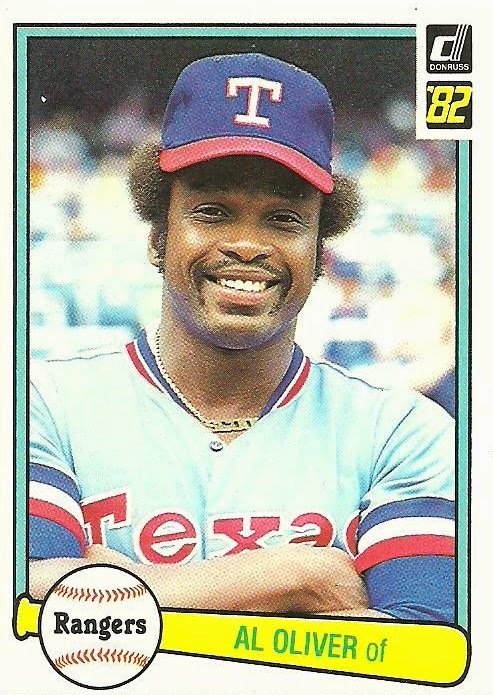 Jon Griffin hit 4 home runs in one game. 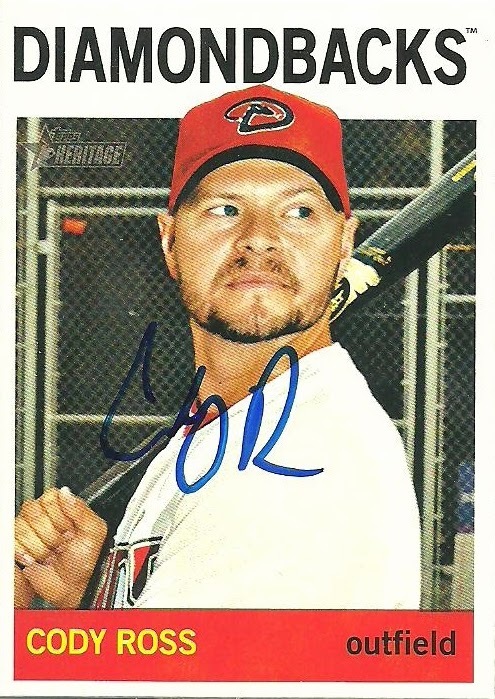 He hit a homer in the 4th, 6th, 7th, and 9th innings of AA Mobile's game against Tennessee. 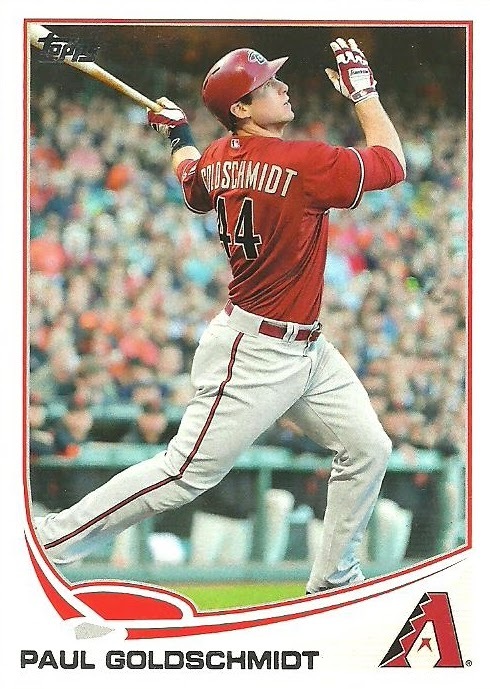 He hit another home run today in his first at bat to hit 5 consecutive home runs. 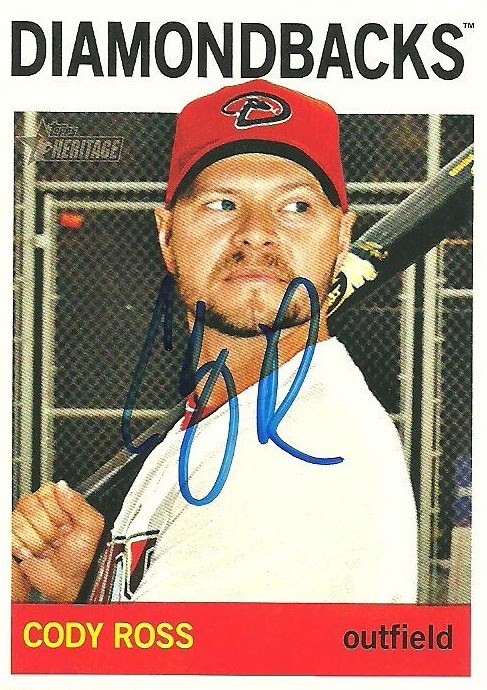 We didn't get any autographs before the game on Saturday, but I realized that I never showed off these two 2013 Heritage Cody Ross cards that we got signed before the game on April 26th. 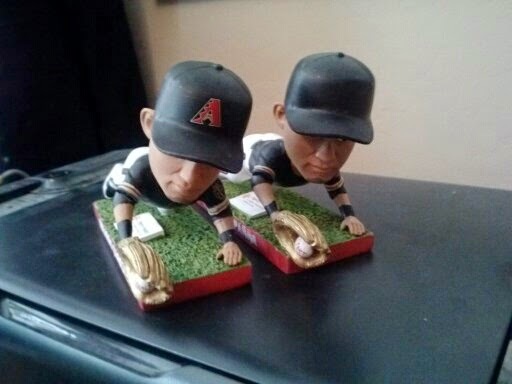 I also never showed off the Patrick Corbin bobblehead from that game either. I've got some catching up to do. 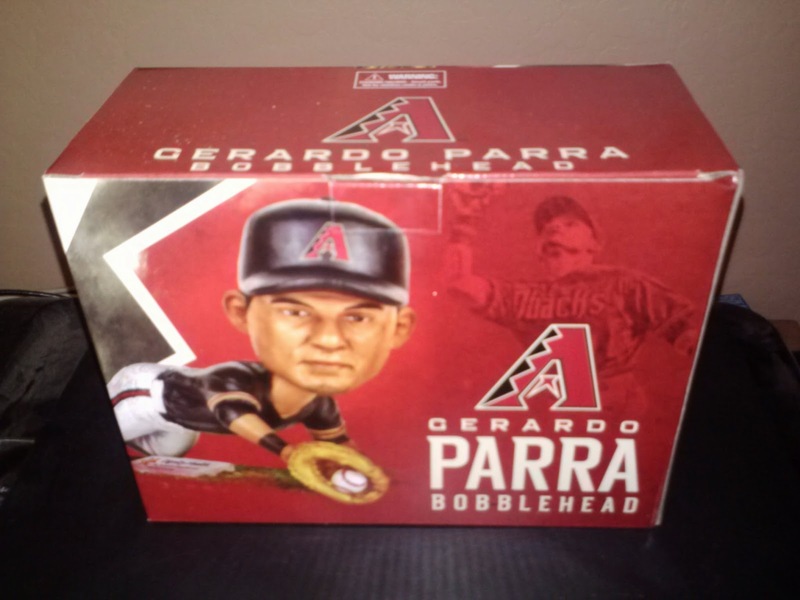 I mentioned that Saturdays Diamondbacks game was Gerardo Parra Bobblehead Night. On Sunday I opened up one of the bobblehead boxes to get a picture and this is what I found. 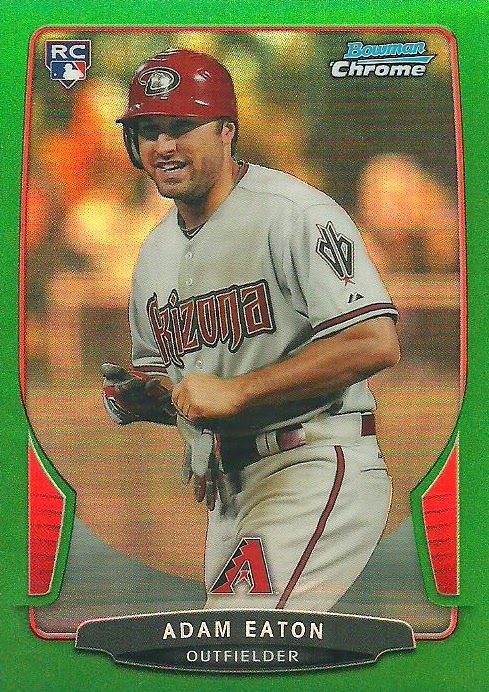 I guess the Diamondbacks got Panini to make the bobbleheads since the D-Backs logo is missing from his hat. It actually took me a minute to figure out what was wrong. I opened the other boxes and all the other bobbleheads had the logo on the hat so I thought that was really weird. This season the Dodgers have dominated the Diamondbacks. Before the game last night, the Dodgers had beaten the Diamondbacks in 8 out of 9 games so far this season, including a 7 -0 beating on Friday night. We got tickets to last nights D-Backs vs. Dodgers game through Goodyear Little League. The players got free tickets wherever you bought your seats so we opted for the best available. 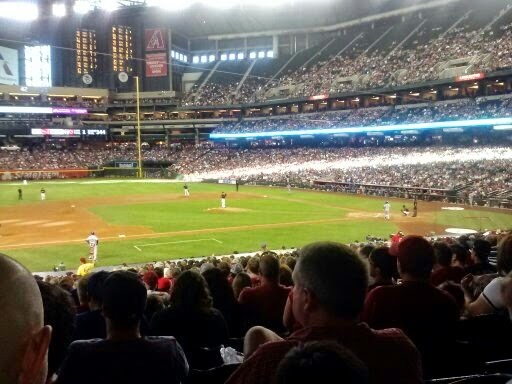 We sat in row 33 behind the Diamondbacks dugout. Here was our view. 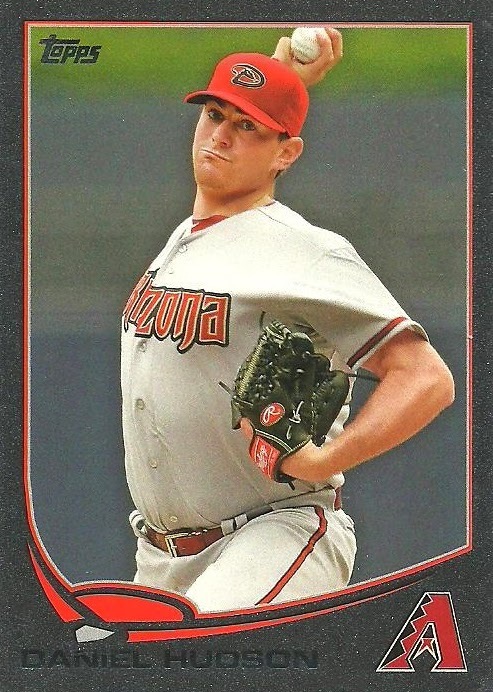 Chase Anderson took the mound for the D-backs and faced off against Clayton Kershaw...at least for the first 1 and 2/3 innings. 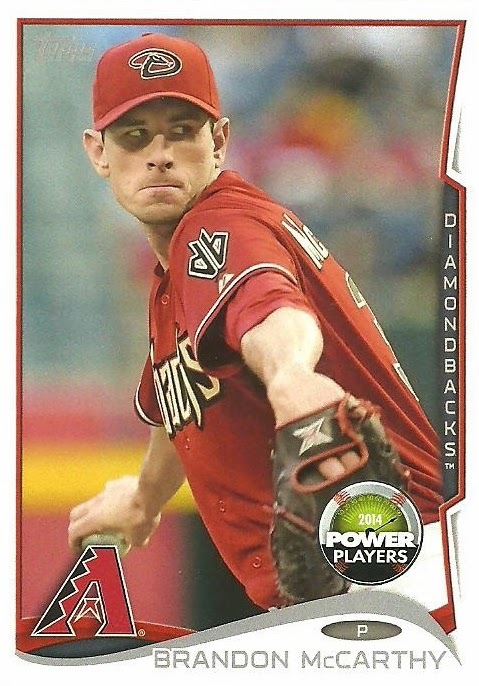 The Diamondbacks got to Kershaw in the 2nd inning, hitting 3 triples (a franchise record) and scored 7 runs off the Dodgers ace before he was pulled from the game. 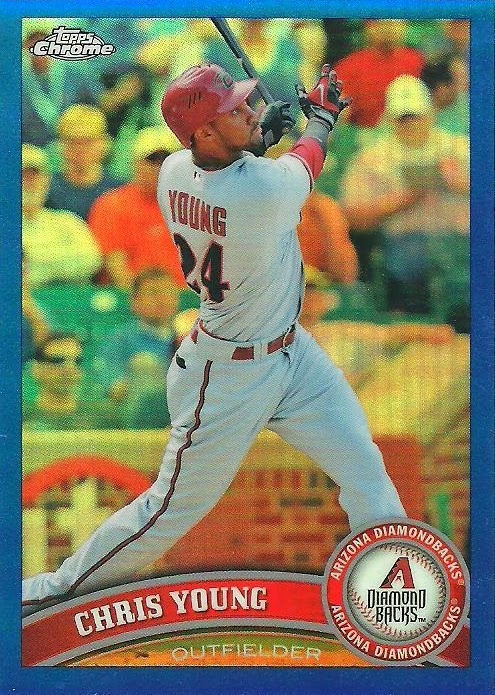 The hitting continued for the D-Backs, and although the Dodgers scored 2 runs in the 3rd and 5 runs in the top of the sixth to trail the D-Backs by only 2 runs (9-7), the D-Backs scored 9 additional runs in the 6-8 innings with a final score being 18 - 7. Anderson got the win. The second of his MLB career in as many starts. 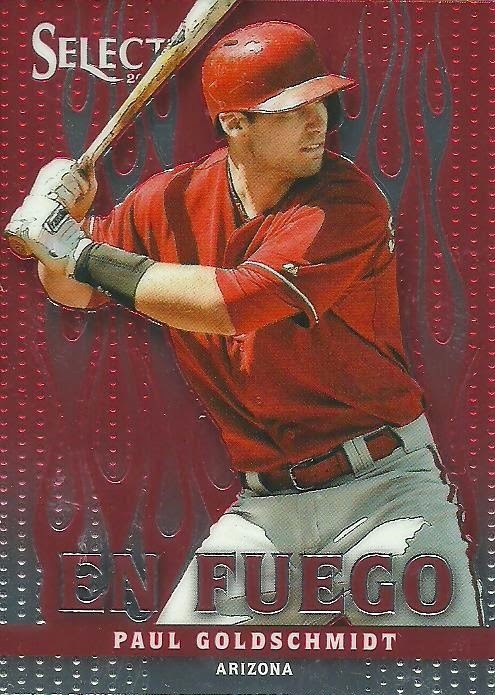 The 18 runs scored by the Diamondbacks was a franchise record, as was their 21 hits in a 9 inning game and their 13 extra-base hits. 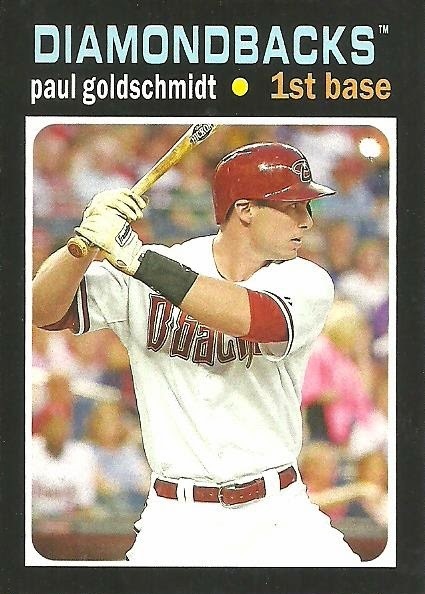 Paul Goldschmidt clobbered 2 home runs and had two doubles. His 6 RBI in the game were a career high. It was a great game and I don't have much of a voice this morning! 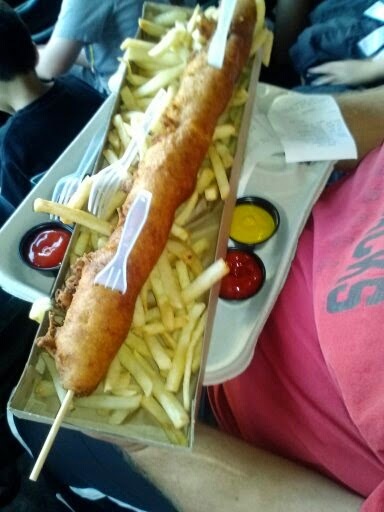 We also tried the 18-inch D-Bat dog with fries. It fed our family of four and was delicious! I also met up briefly before the game with fellow blogger, Adam, of Thoughts and Sox. We completed a quick trade, which I'll show of on a later post. 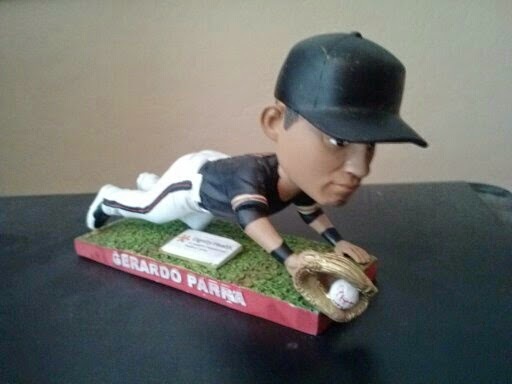 It was also Gerardo Parra Bobblehead Night so that was awesome! I'll show the actual bobblehead of in a post later this week. This is my 41st different D-Backs bobblehead. 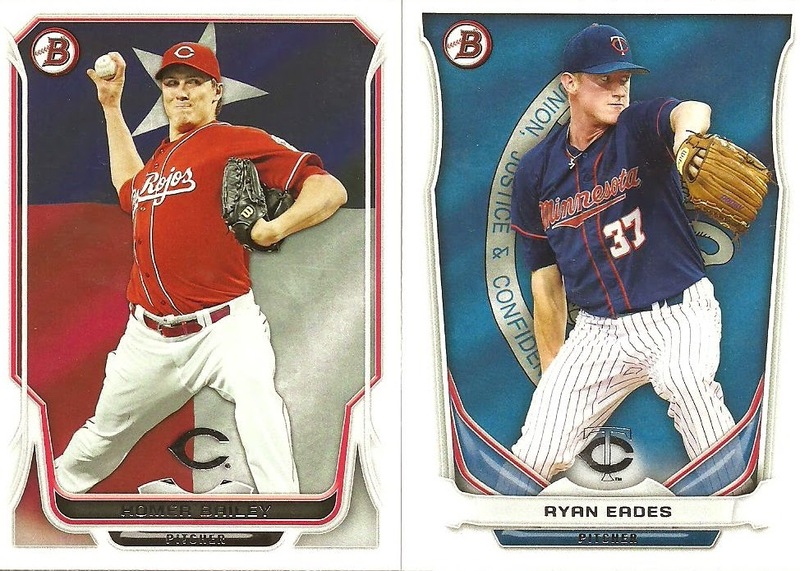 I came across these two cards in the dime box at my LCS yesterday. I'm not sure what about them caught my eye first. It might have been the baby blue uniform, the hair, or the gold necklace. Maybe it was the contrast in the facial expressions. 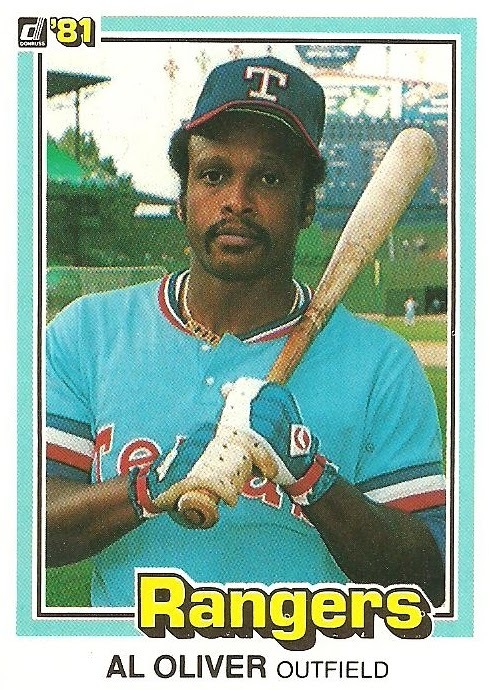 It might have been the way his hat brim is folded on the '81 Donruss card. Whatever it was, I'm glad I picked these up. I think I'll file them under "Bling". Do people still say "bling"? What should I do with this box of 1989 Topps? 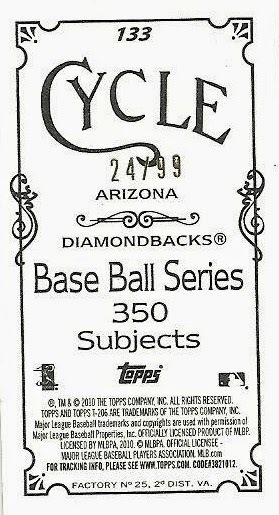 Help me determine what to do with this box of 1989 Topps. 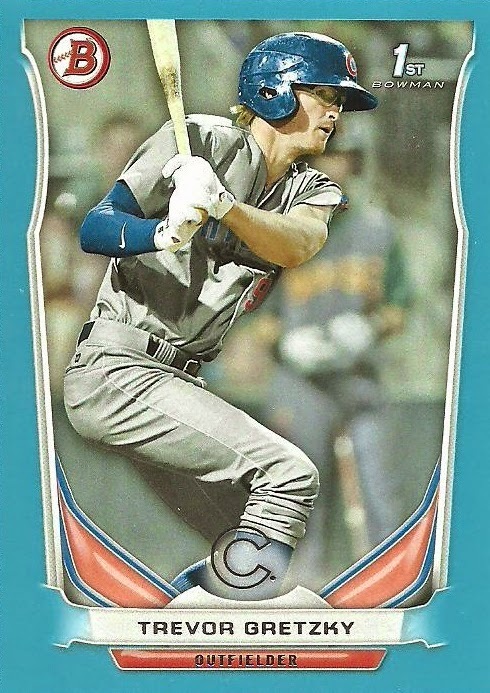 On Monday I pulled a PWE out of my mailbox and got Zapped! Zippy Zapped, that is! 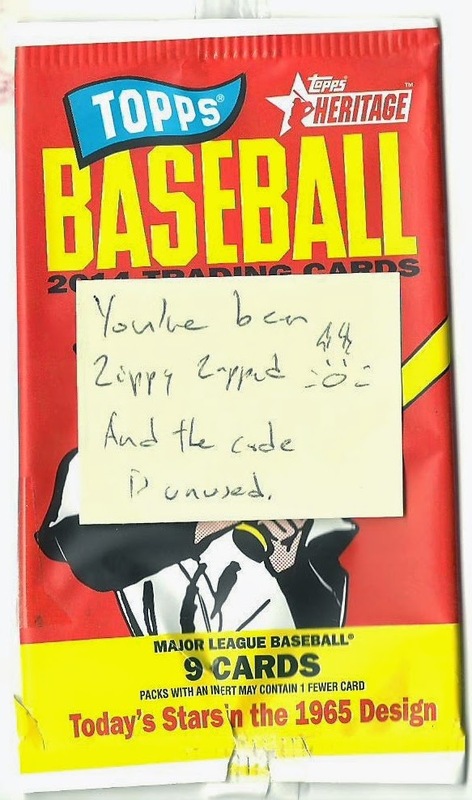 Kenny, of the blog Cervin' Up Cards, Zippy Zapped me... and boy did I need it! You see, since March 1st, I've only posted a total of 15 times. That's going to change! 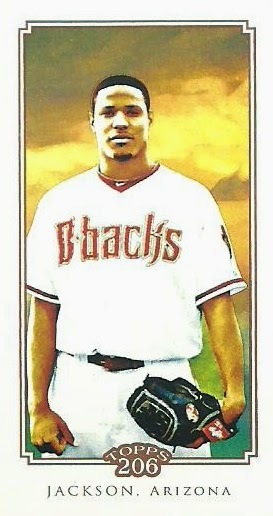 The first card I saw when I opened the pack from Kenny was this 2010 Topps 206 mini of Edwin Jackson. It was in one of the mini sized top loaders so I turned it over and saw that it was a Cycle back and serial numbered 24/99. Sweet! 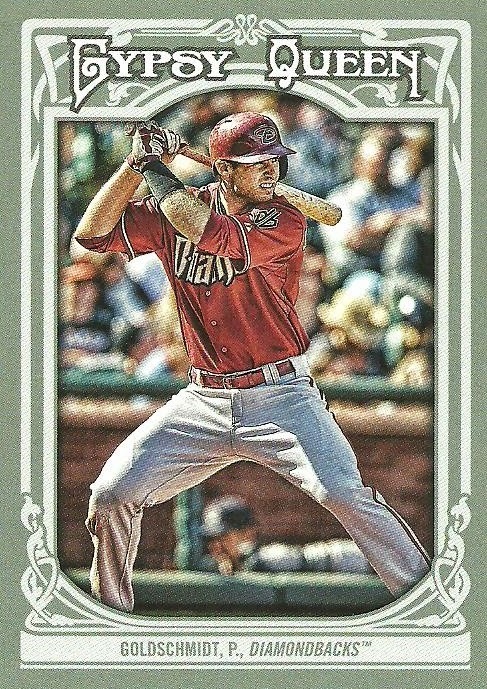 Next up were a couple of Paul Goldschmidt Opening Day cards. 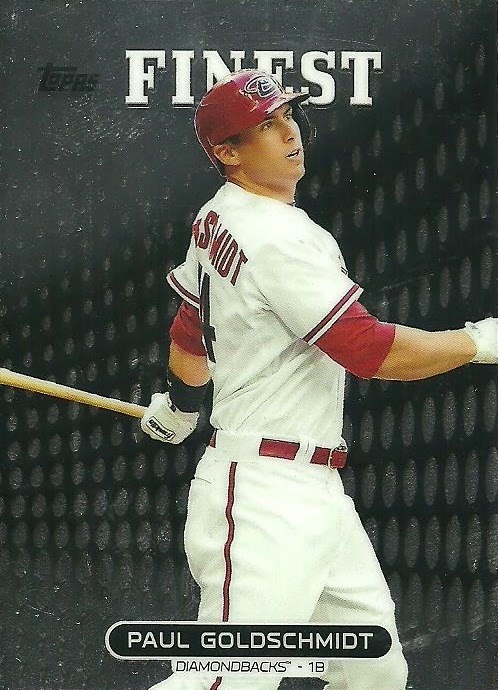 Anyone who knows me, knows that I'm obsessed with Goldschmidt. 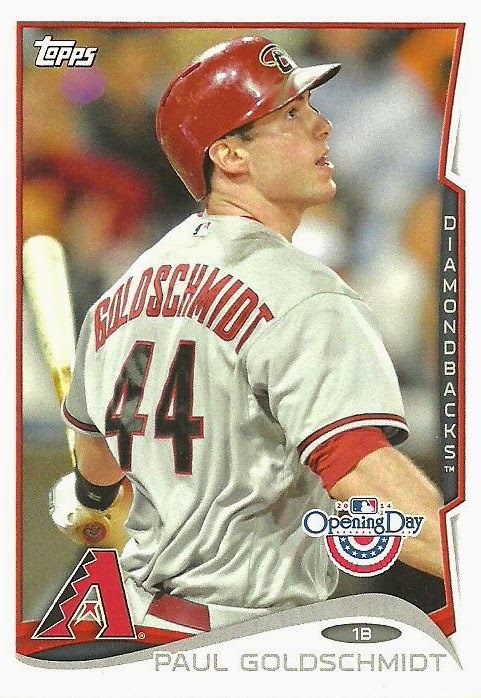 I even started a blog called Goldschmidt Happens , which I needs to do more with as well. 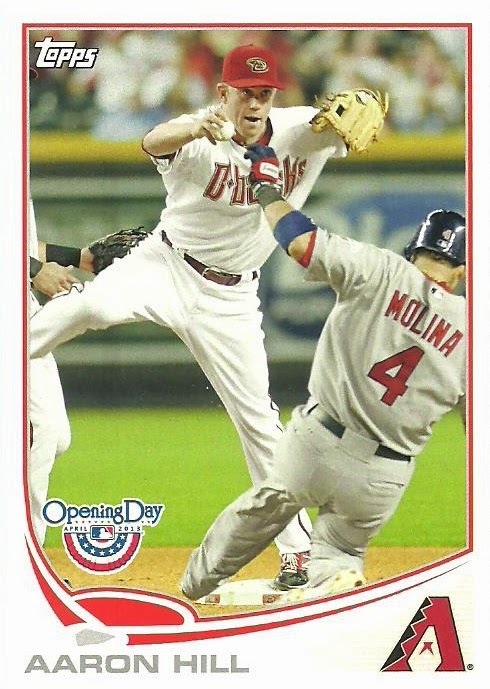 The next card was the Power Players card that the note indicated was unused. 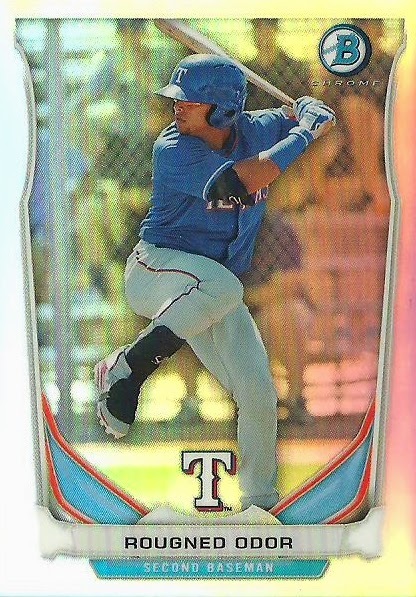 I have to be honest, I haven't looked into this promotion at all so far, since this is my first actual Power Players card. I'm excited to check it out. 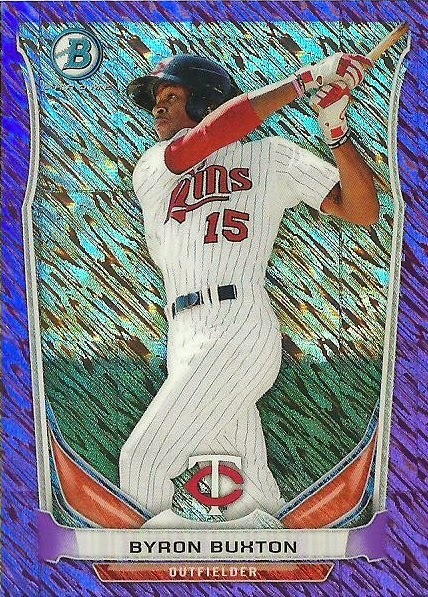 I am glad that the card features a player on it this year. 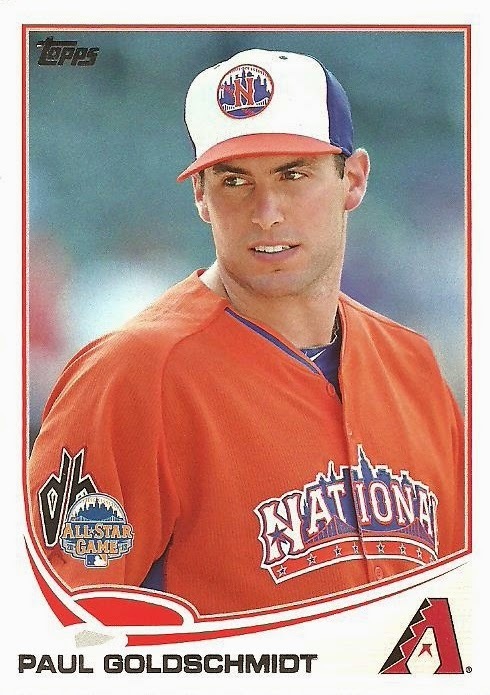 Brandon McCarthy has actually done okay this year. 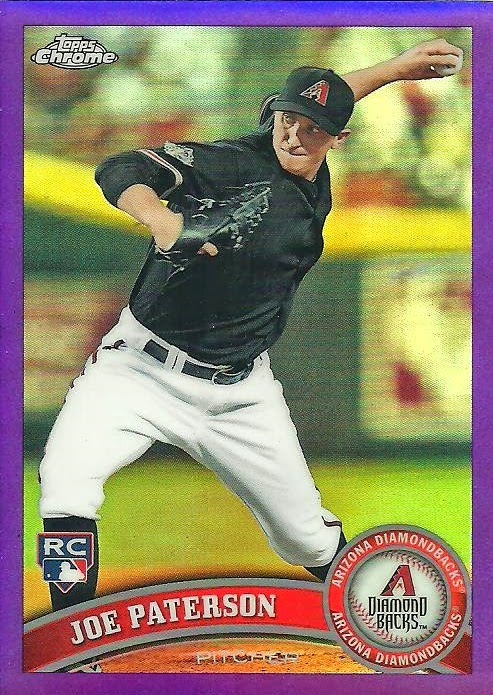 He pitched great today going 8 innings and only giving up 1 run, but the D-Backs ended up loosing. 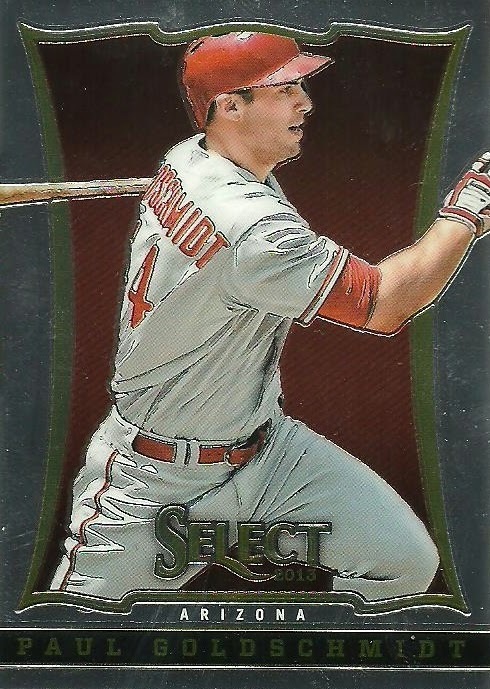 Another Goldschmidt followed, this time from 2013 Finest. 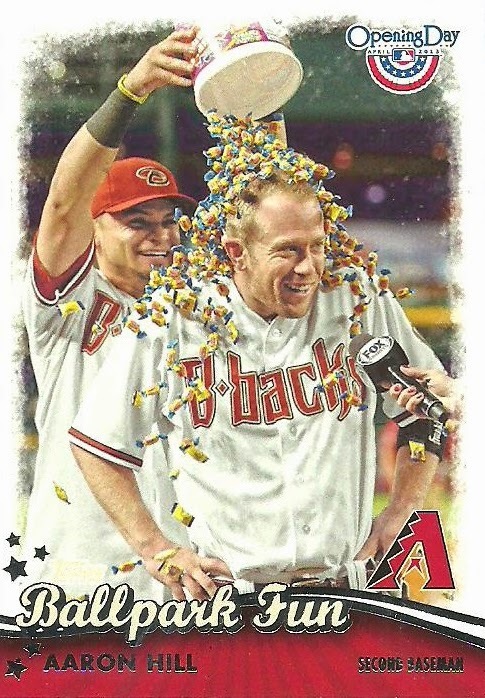 This Aaron Hill Ballpark Fun card followed. 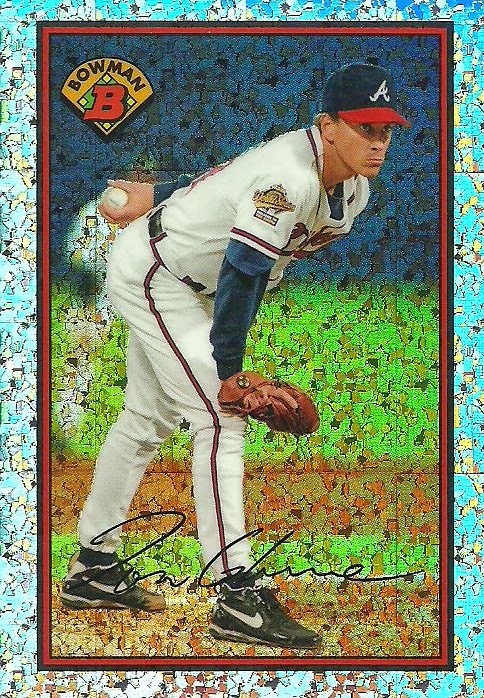 These are some of my favorite cards because they bring back specific memories. 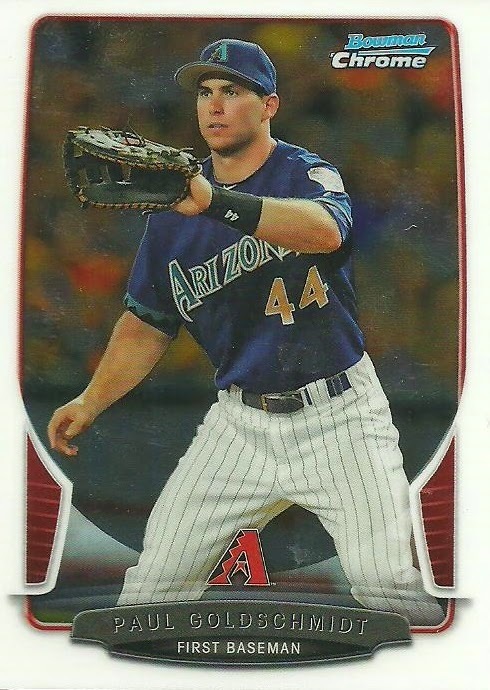 Two more Aaron Hill cards followed. 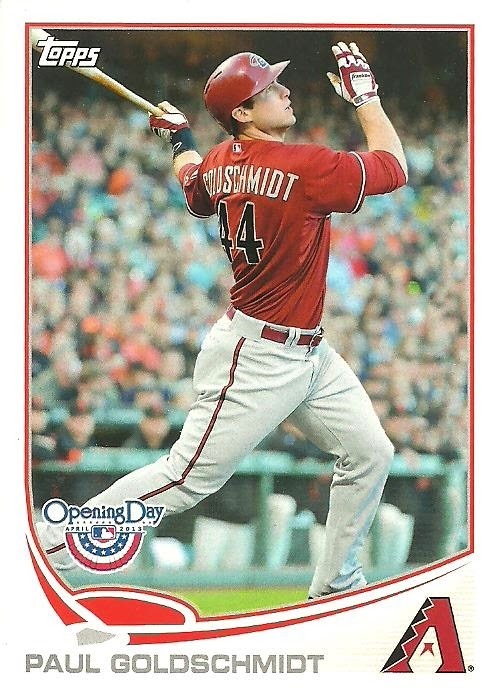 This 2013 Opening Day card and the 2013 Target Red Parallel. 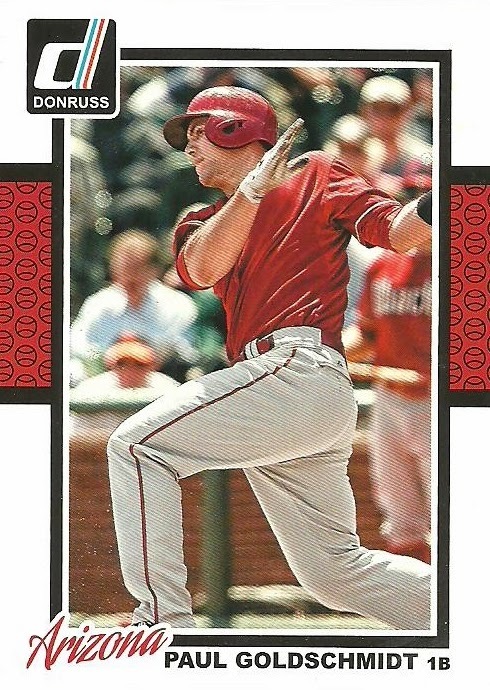 I do love the Red parallel D-Backs cards. 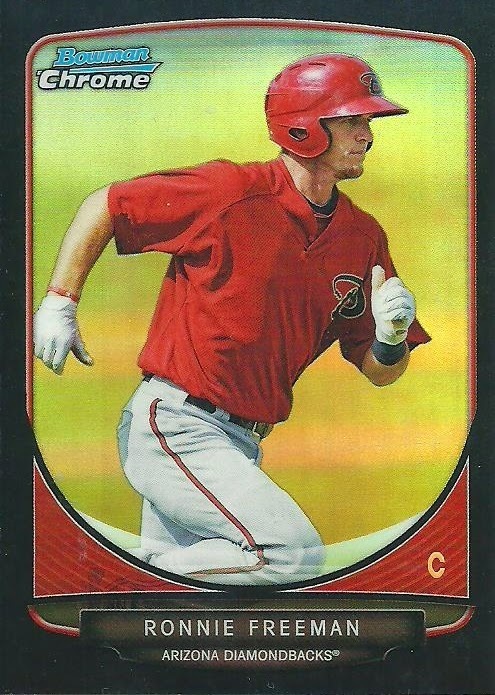 The final card in the pack was this beautiful 2011 Topps Stephen Drew card featuring him rounding third, presumably after hitting a home run! Thanks for the all the great cards Kenny! 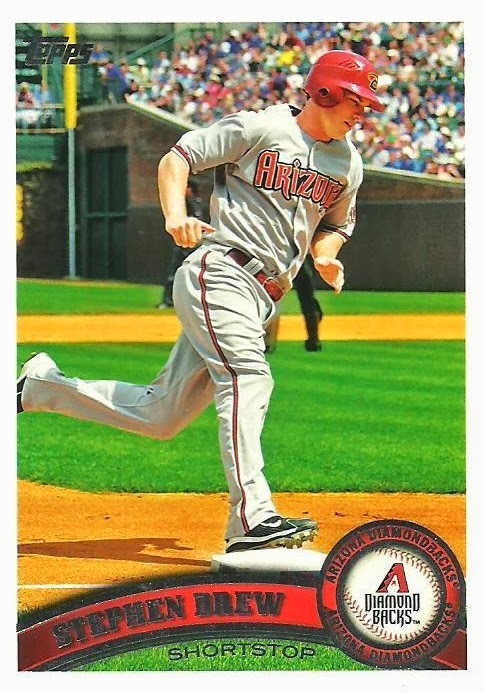 Alex, of the blog Chavez Ravining, sent me a package filled with Diamondbacks. 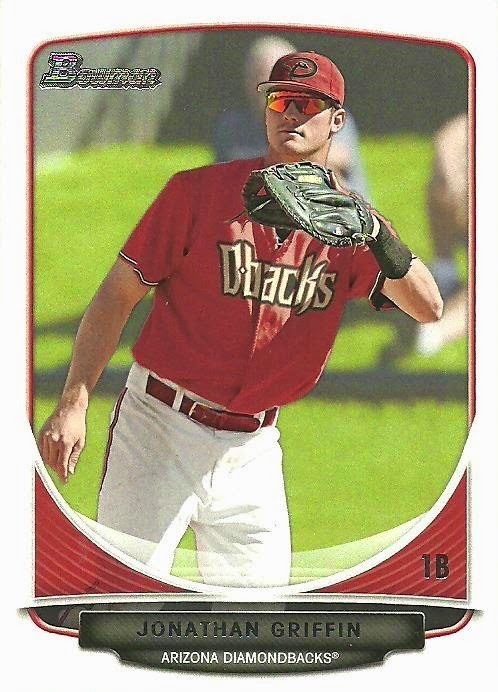 As a Dodger's fan I'm sure Alex was happy to see these D-Backs go, but I still really appreciate the gesture.Thanks Alex! 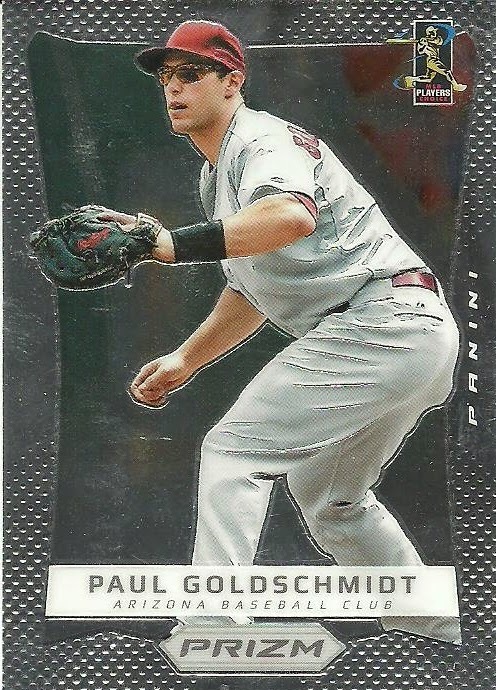 Let's start with some Paul Goldschmidt cards. There were more than a few.